Too little honey for the winter? Posted: Sun Oct 12, 2014 5:57 pm Post subject: Too little honey for the winter? My left hive has 7,5 kg of "stuf" on them and my right hive has 8,5 kg of "stuf". Now, "stuf" means all the wax, honey and bees (since it was evening) I'd say at least 80% of them was there. I am wondering do I have enough honey? I guess not (I've got them only after the acacia flowering, this summer in Serbia was very bad for all and they were package swarms). I guess my bees did not grow much since I've bought them (there was 1,3kg of bees each). Also - do you know what percent of weight of a comb full of honey is wax? And - what do you propose about the winter feeding? The wax is amazingly light and I believe will make very little difference to the weight. The search function on this forum should work to give you lots of ideas if you search for "winter feeding" , "syrup feeding", or something similar. Even if this is your first winter you still know your local conditions best. If you think you need to feed them, then do. Better safe than sorry. It is much harder to feed mid-winter, and feeding now, they will store it so that it helps as insulation for their cluster too. I feel it is getting late already. They will need a thick syrup so they have less water to evaporate as the weather is cool, nothing added just sugar and water, If it is already cold with you then it may be already too late for syrup. What do your local beekeepers do? Perhaps you do have enough honey and perhaps they don't need feeding, I don' know, but no harm to help a colony in their first year just to be sure. I am in also in first year with top bar hives and hvae 4 at the moment. No real top bar hve knowledge in the area so look to internet, books and DIY. As we lack the experience to determine if this is good or bad then play it safe and feed the bees 2:1 sugar syrup (make it at home) or feed them ambrosia (commercial produced inverted sugar syrup;expensive). I also add Hive Alive as a health aid. I don't want to lose them so I am providing them with stores to get them fat and healthy to get through the winter. you can add this to either type of syrup. Allow for 1 gallon of syrup per hive and more if they keep taking it all. Although here in the UK, the Ivy has been prolific this year and the bees are still bringing in nectar and pollen I have also been feeding them a pollen replacement candy like Inolapi Candipolline (or Nektapoll or Neopoll). If it is getting too cold for the bees to successfully reduce the syrup into "honey" then you may be better feeding them the Candipolline or plain sugar candy (bakes fondant). You can also feed them plain sugar candy later in the winter too because you don't want the presence of the pollen to kick off brood expansion! You should also have completed your varroa treatment using an organic product like ApiLife Var or ApiGaurd (Thymol) or MAQS (Formic acid) (not all are organic). In Serbia we have a very mild October this year - it is between 13 and 25 degrees. And it is going to last till the end of October, so, I was thinking about buying those ... well, I don't know the word in English, but basically they are not liquid, they are something like "bee cakes", basically sugar and little something on the side. they are something like "bee cakes"
Fondant. yes if it is cold fondant is best, but I think it is more expensive and more for emergency winter/spring feeding. If it is mild as you say, then 2:1 sugar syrup and the bees will store that in their combs (they may even build a little more comb if they have food and good weather), but stop when cold weather comes. We still do have some flowers blooming around and bees are all over them. Is that pre-winter feeding going to impede their gathering of the food? Is it also going to facilitate them to start laying too many new bees? I think that as new beekeepers we have to learn to trust that the bees know what to do. As long as you are not seeing disease in the hive, no wasp problems, no robbing, that Varroa have been treated for and any additional food is being taken, trust that the bees are getting ready for winter. They will need the honey for carbohydrate and pollen for protein for themselves and the little brood they rear over the winter months. Try and make sure that the new bees coming now are fat and healthy for winter. This will increase the chance of you having a strong colony next spring. and only feed your bees if you think that the hive is light (your original concern). You could wait until this current flower crop is finished and check the weight of your hives again to see if any feeding is required. Yes, but I still don't know how much honey is enough for the winter. I guess that my bees did not grow that much in numbers (weight), so to say that out of 8,5 kg i subtract 2kg for the bees, I have only maybe 6,5 kg. Should I target to around 10 or 15 kg? To feed them until they accumulate that much food? If you do wait it will be too late for syrup feeding and you will only have the option of emergency feeding. The bees are gathering a lot of pollen here. I would guess that bees collecting pollen will still do so and other bees will store the syrup in combs. Having enough honey is not just about food it is also insulation in very cold weather. When it is winter there is little you can do, it is already getting very late, it takes time for them to store the syrup. Thin syrup stimulates brood production because it is like a nectar flow but I believe thick syrup doesn't. Just seen your last post. I don't know how many Kg. I would just start feeding and see how fast they take it . Meanwhile keep reading old posts, lots of gems of wisdom on this forum to help guide your instinct. Posted: Mon Oct 13, 2014 9:21 pm Post subject: how many KG stores for the hive to come through winter ? The answer really comes with experience of your bees in your area and your winters. The national Bee Unit in the UK suggests (of course this is for British National square boxes!) after colonies have been treated, beekeepers should then reduce colony entrances and assess whether feeding needs to be carried out. Lift the roof off of the colony and heft the hive from each side of the brood box. If the colony has sufficient stores, then it should be difficult to lift. Each colony should have between 20-25 kg of stores for the winter. At BackYard hive - top bar beekeepers in Colorado they talk about 7 honey combs for overwintering on. I had read somewhere there a top bar comb weighs about 7lbs so that is about 49lbs of honey(includes the wax comb). Thanks, this pretty much clears it up. However, are thos 20-30 kg for colony of ~40,000 bees or for smaller colonies? Also, I live in winter zone 6 - if that helps (there are few days each winter that temperature can drop to -20). Had a search on internet ... British Bee Keepers Association (BBKA) states that a full colony is around 35,000 bees but I have read elsewhere that they can be 50,000 to 60,000 strong. BBKA also says that the hive can reduce down to about 5000 bees. So these food stores must relate to the winter size of the colony, not the summer size of 35,000-60,000 bees. It occurs to me that if your colonies are small then you may need to combine them! In our climate lots of beekeepers over winter nucs, or small colonies and they do not need 20-25kg of honey. One cannot say exactly how many kg a not fully grown colony will need. but I think they will only be able to take a limited amount before it gets too cold, they may need to build more comb too. For winter Zone 6. It is my understanding that when the temperature gets below freezing the bees cluster and use very little reserves (they cluster at and below 6C). In our climate it blows hot and cold and the bees break out of their cluster frequently and use more stores. For your climate though I would guess that the insulation properties of the honey are important. The time that the bees really need their honey is in the spring. They need enough food to build a whole new workforce before the first big flow next year, when they wake up in spring they are hungry and it is better that they have that food stored now. PS, Welcome to the forum BenhamBees. Thank you all for your help. I have decided to start giving them sugar syrup 2:1 which is thicker so that it does not turn on the breeding. I will try to do so till the end of october and from time to time I will check how much food has been accumulated. Is there something to add to the syrup that would help the bees in some way? Some kind of natural remedy that can go into syrup? There are a few threads on this forum about what can be added to the syrup (try the search function), but some experienced beekeepers feel that those things can cause more harm than good. It doesn't make sense to me to introduce other properties with the syrup, in my opinion the bees are best able to find the micro elements they need with their pollen and propolis foraging. Plain white sugar and water seems to be best. In Scandinavia production colonies need no more than 15kg of sugar for the winter. New splits less. After the harvest in July I leave the bees with 10 frames (new splits with even 8frames). When feeding extra I feed until the last comb is filled, then stop. Some smaller colonies stop taking syrup even if there is space in the last comb. That's fine with me, they know how much they need. Like all in Scandinavia I mix 5:3 sugar to water. 5kg sugar to 3 liters boiled water. I add 1 table spoon of organic apple cider vinegar and a cup of tea made with dry organic Camomille and dry Nettle leaves. This is not a remedy but to introduce minerals otherwise missing in the sugar. Vinegar to lower the pH. I simply look at the colony to "feel" their size so I have no idea how many bees they have at this time. It's too late in the season to open brood nest though so I only remove the follower board fast to see if the last comb is being filled. Bees always start filling above the brood nest first and then continue to store the extra honey/sugar syrup in the honey area. Ask your local beekeepers when they start feeding bees and how much they feed. I suggest you do the same. Thank you - this was very helpful. Hmmm - I could then "shorten" the colony to 8-10 frames, which means that one or two smaller empty combs are going to be taken out. And I could do it even before I start giving them this syrup. While I am writing this, I am mixing the syrup. 1 Question though: Do you add 1 cup of tea beside the 3 liters of boiled water, or is it included in those 3 liters? Thank you once again for the infor. It's included in the 3 liters per 5kg sugar. Yes you take the extra combs out and leave 10 and place the follower after the last one. Then start feeding. Once feeding is done place an old blanket behind the follower to reduce draught. 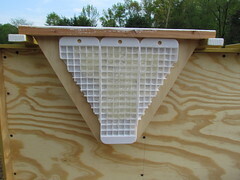 Place a styrofoam insulation on top of top bars above the brood nest (under the roof). Make sure the Camomille and Nettles are dry before making tea. Also make sure to refill as soon they empty the jar. You don't have much time left before it get colder. Bees have to dehydrate the syrup this takes time. Keep at it. I refill every day 750ml glass jar per colony but now it's colder so it could take them 2 days. Please the jar close to the follower board. Do you know how to make an inverted jar? It's very easy. Google "inverted jar bees"
I have the store bought feeding trays. I have made a custom top bar just for this purpose: it has a 1 cm wide slit in the middle trough which bees can go directly to the feeding tray (but can't go anywhere else). It seams that it did pretty good job in June when the colony started. I was also thinking on making some kind of "upper room" with small access to the inside of the hive. In that "upper room" I could put emergency "bee cakes" in the early spring (if needed) without opening the hive. Langstroth beekeepers just place that beecake on the cover board, and since it already has that slit, they can take it. It's easy for the bees in cold weather to take foundant above the frames but not so above the top bars. I never tried feeding fondant because in Scandinavia we all feed enough in Autumn so there is always enough until Spring. You don't often hear about starving bees here.